Hello, dear friends! 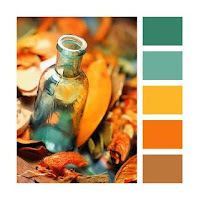 Hope you are enjoying the beautiful fall weather we have been having…and the beautiful colors of autumn. What a masterful creator our God is! What a hard week this has been. Bad news given to a beloved family member and difficult circumstances try to rob us of our joy and peace, but God is always faithful. It is important to keep our focus on the one who holds our future! That being said, spending time in the Bible and prayer, and time in my craft room help me to face a new day with confidence…knowing God is in control and He can be trusted to carry us in times of difficulty. These projects using supplies from the Sweet 'n Sassy Stamps Store are also being shared on the Creative Worship Blog today. 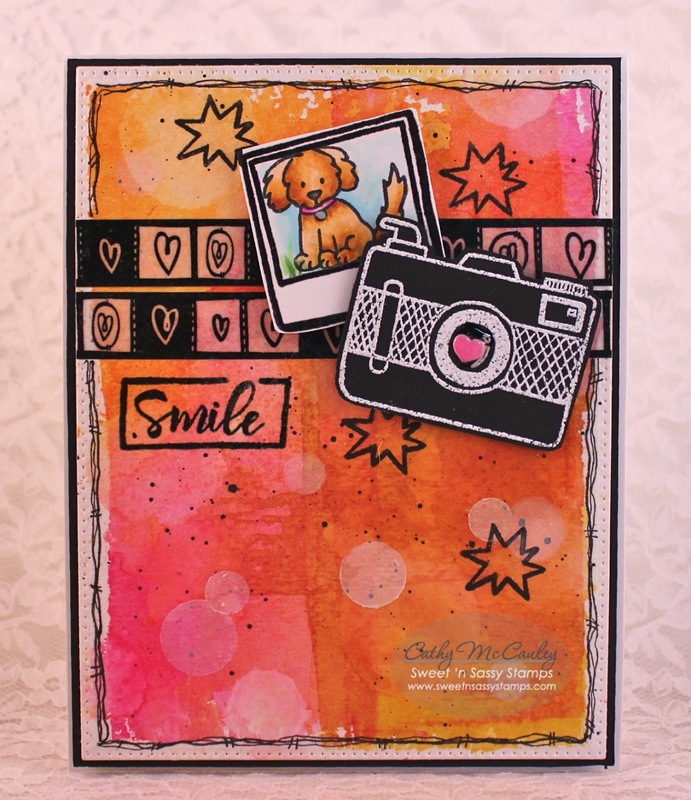 Creative Nugget: The new Capture This Moment stamp set as well as Mini Critters and the Hearts & Stars Scallop Die Set were used to make this card with the CAS(E) This Sketch design for this week. Distress inks on an acrylic block and spritzed with water were smeared onto a piece of water color paper. Water sprayed through a circle stencil and white pigment ink were used to add pointillism to the background. Black acrylic paint was also splattered on. The images were stamped, embossed, colored with Copic Markers, fussy cut, and popped over the strips of washi tape. The sentiment was embossed and the doodled frame added to finish the card. 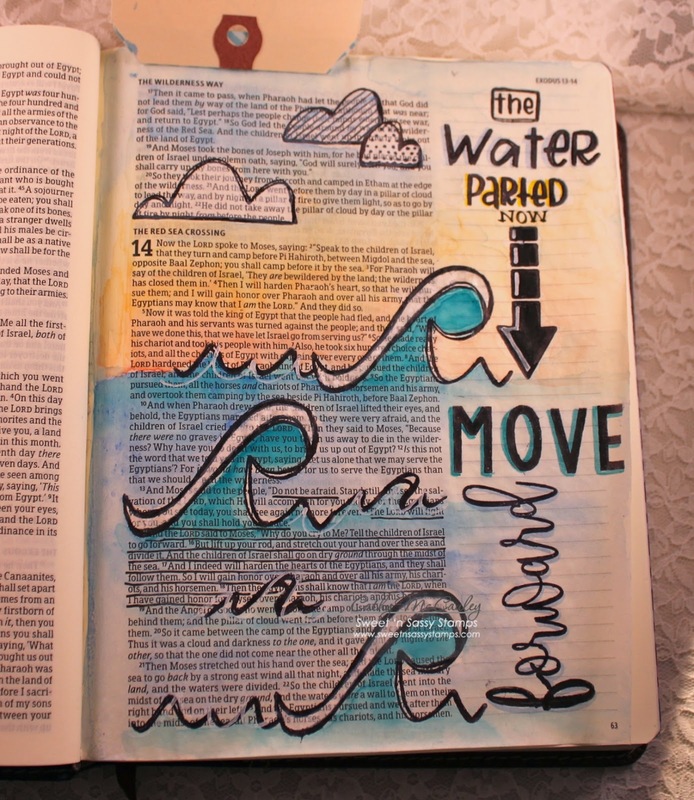 Love spending time in my Bible and the Living Water Stamp Set designed by Rebecca Rios was perfect for illustrating the verse from Exodus 14 where God parted the Red Sea to allow the Israelites to pass over on dry land in order to protect them from Pharaoh. 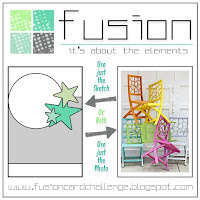 Creative and Inspiratioal Nuggets: My page was prepped with two coats of Dina Wakley's Clear Gesso. 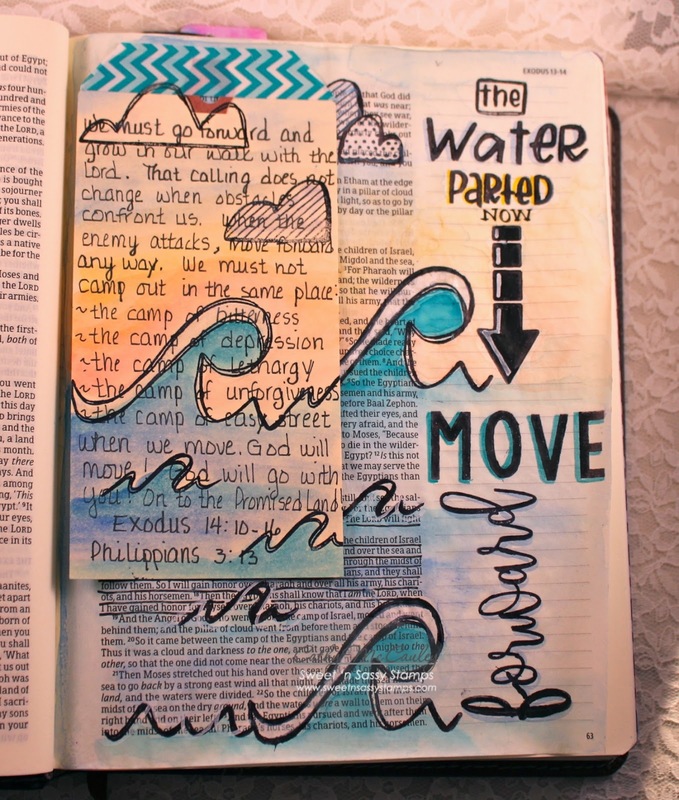 After stamping the images and words, the page was water colored using Neocolor 2 Crayons. Sometimes, out of fear, we stay camped out in the same familiar place…afraid to move ahead. It is very easy for me to want to remain comfortable. 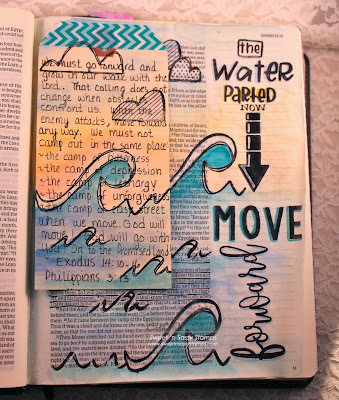 As we take a step of faith and move forward, God goes with us! 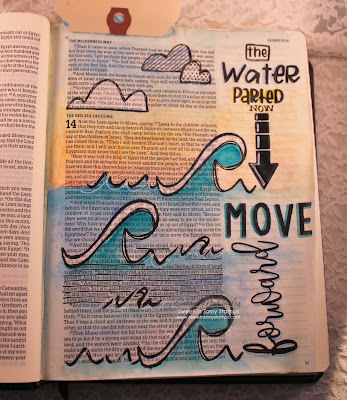 My pastor preached from this verse of scripture not long ago so a tip in was created and added to this page to remember some of his main points. ~the camp of easy street! Move forward in order to reach the Promised Land, and remember…you will not be alone! 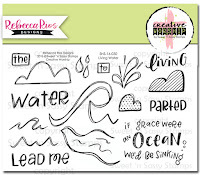 The stamp sets used to create this page include Living Water, Classy Script Alpha, All of Me Alpha, and What's Up? Thank you so much for stopping by…have a wonderful fall day! Hello friends! Happy Saturday! Hope your weekend is off to a great start! 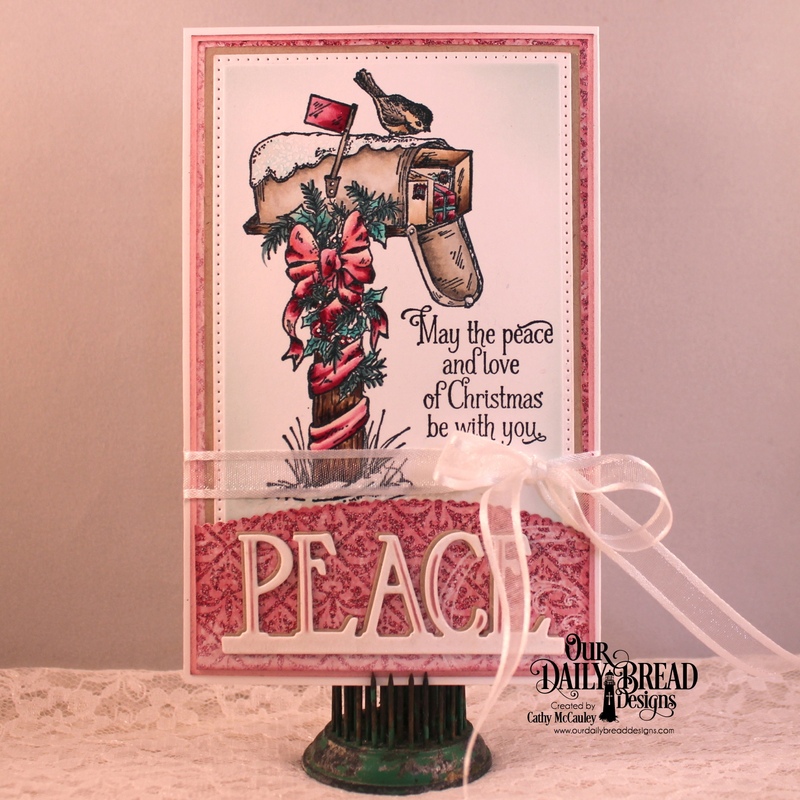 I have been having so much fun using the new stamps and dies released by Our Daily Bread Designs this month, BUT there are even more Christmas goodies to come next month and from today until October 31st, ODBD is offering Pre-Order Bundle Specials on the November 2016 Release! 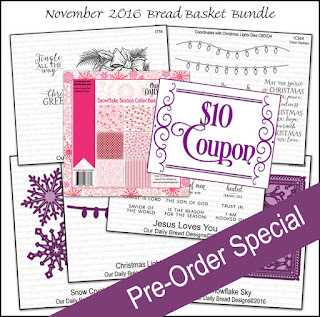 All November 2016 Pre-Order Bundles will begin shipping on November 1, 2016, or sooner. Please see the ODBD Blog for more details. 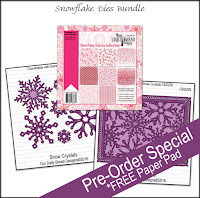 Creative Nugget: Paper from the new Snowflake Season Collection, Neenah card stock, and pink card stock were all cut with the Snowflake Sky Die. Part of the white and pink pieces were cut away, stitched together, and popped up onto the card front. 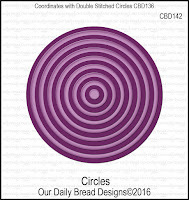 The sentiment was embossed, cut with a Pierced Circle Die, and matted with a Circles die cut. 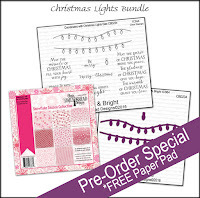 The Christmas Lights were stamped and cut with the coordinating Christmas Lights Dies. Glitter gel pens were used to color the lights and Glossy Accents was added to make them sparkle and shine. The Lights were then popped onto the white panels along with an organdy bow to finish the card. 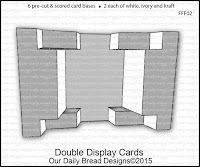 For more beautiful projects and inspiration using the Pre-Order Bundle products click on the links below which will take you to the blogs of the other Breadstick Designers. 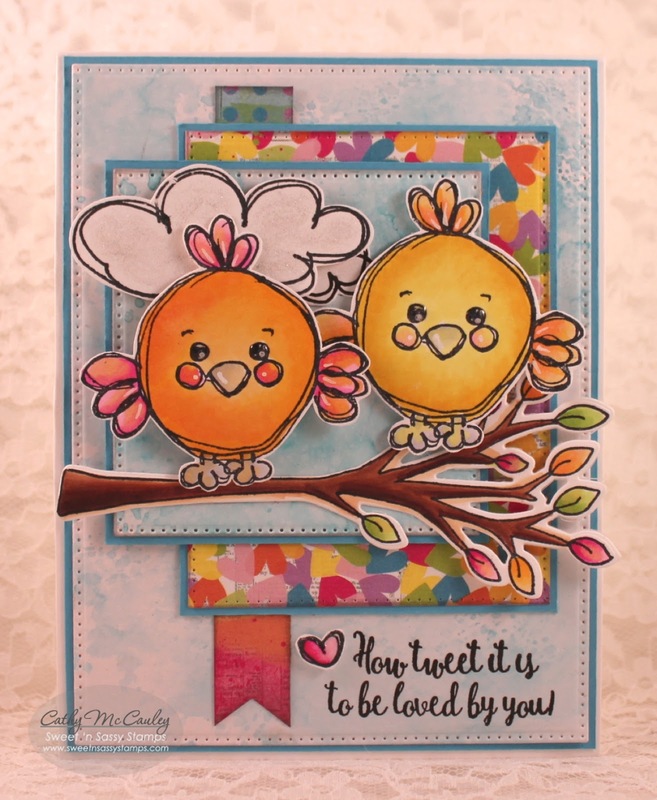 Creative Nugget: Now, isn't that little birdie as cute as can be? 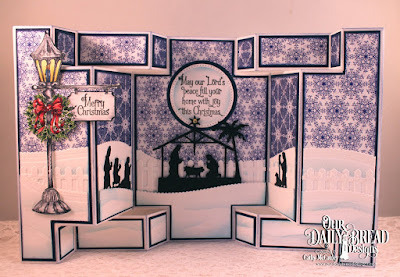 The blue panels were made with distress inks on mixed media paper and the designer paper is from Bo Bunny. Copic Markers were used for the coloring of the images and the Freshly Made Sketch for this week was used for the design. 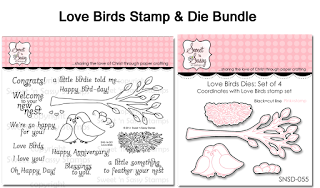 The branch is from the Love Birds stamp set and was cut with the matching Love Birds Die. 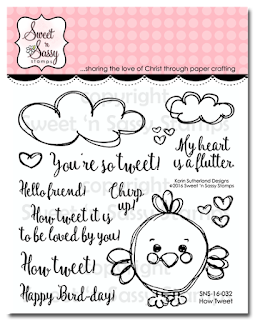 To see more adorable cards and Bible Journaling pages using How Tweet, hop on over to the Sweet 'n Sassy Stamps Facebook page! Hello friends! 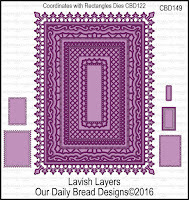 Today we are taking another look at the Our Daily Bread Designs October 2016 Release. Seriously…I can't believe I am writing October! 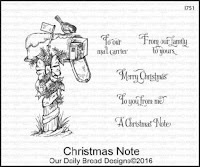 Christmas is creeping up on us and the Breadbasket Designers have some wonderful Christmas inspiration for you today. Creative Nugget: The highest hill was masked and Stormy Sky, Faded Jeans, Chipped Sapphire, Dusty Concord, and Black Soot distress inks were sponged onto the sky. 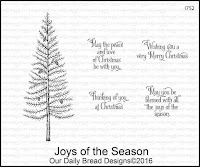 The tree from the Joys of the Season stamp set was stamped to the right in VersaMark ink and white embossed. The mask was removed before heating. The second hill was masked, sponged with Stormy Sky, and the next tree was white embossed. A few more hills were masked and sponged, and finally the tallest tree was embossed on the foreground. The sentiment was stamped in VersaMark and Chipped Sapphire and clear embossed. A few paint splatters, metallic thread, and gems were added. Art Anthology Gilded Gold spray makes the whole card shimmer! 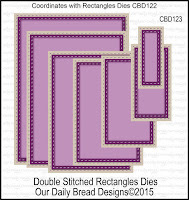 The layers were cut with Double Stitched Rectangle Dies and the Flourished Star Pattern Die. A piece of paper from the Christmas Card Collection 2016 was sandwiched between the layers. 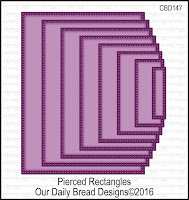 To see all of the wonderful fall creations stop by the Our Daily Bread Designs Blog. Then click on the links below to see all the details for each project. Hello friends…happy Friday! 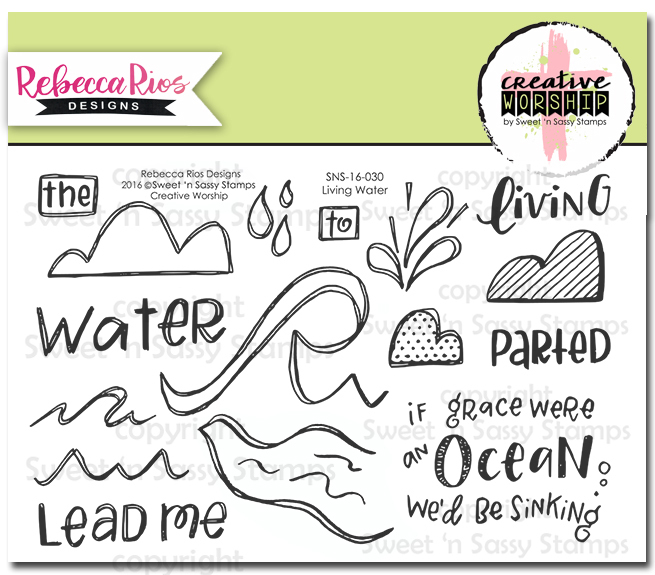 Today Sweet 'n Sassy Stamps is featuring a brand new stamp set just added to the store…Inspirational Word Art 2. If you liked Inspirational Word Art 1 you will love this set as well. I have two very different cards to share that were made with this new set. 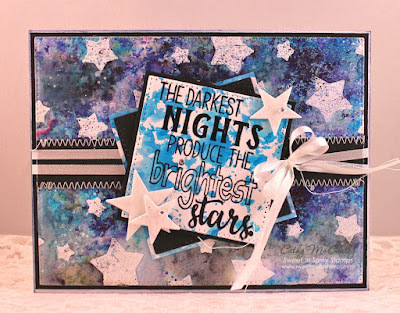 Creative Nugget: The background was created by sponging VersaMark ink through a star stencil and embossing the stars with white embossing powder. Color Burst pigment powders were sprinkled on and spritzed with water to create a night sky. The left over Color Burst left on my craft mat was spritzed again and mopped up with more pieces of mixed media paper so none of the pigments went to waste. One of these pieces was used for the sentiment panel. 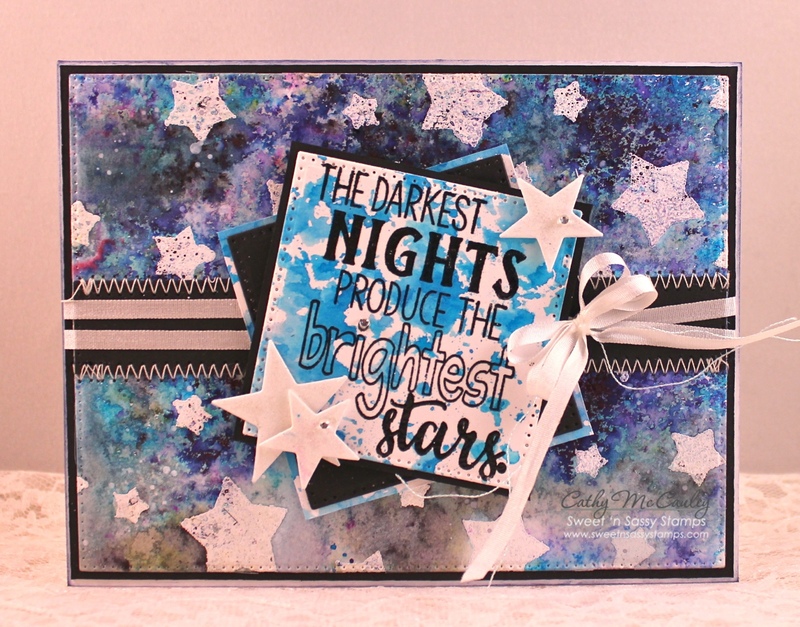 The Stars Dies were used to cut a few extra stars and silk ribbon was added to finish the card. 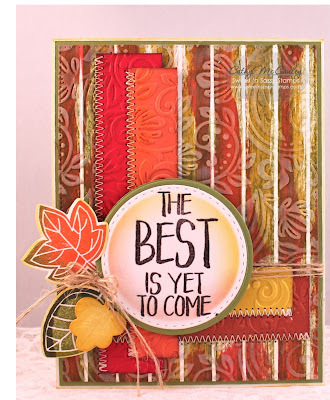 My next card uses a different sentiment from the Inspirational Word Art 2 stamp set. 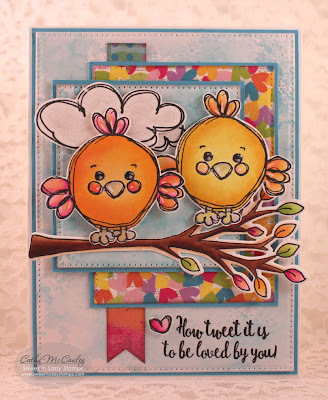 Creative Nugget: The background for this card was made after watching the Carved Wood Tutorial on Stamp TV. 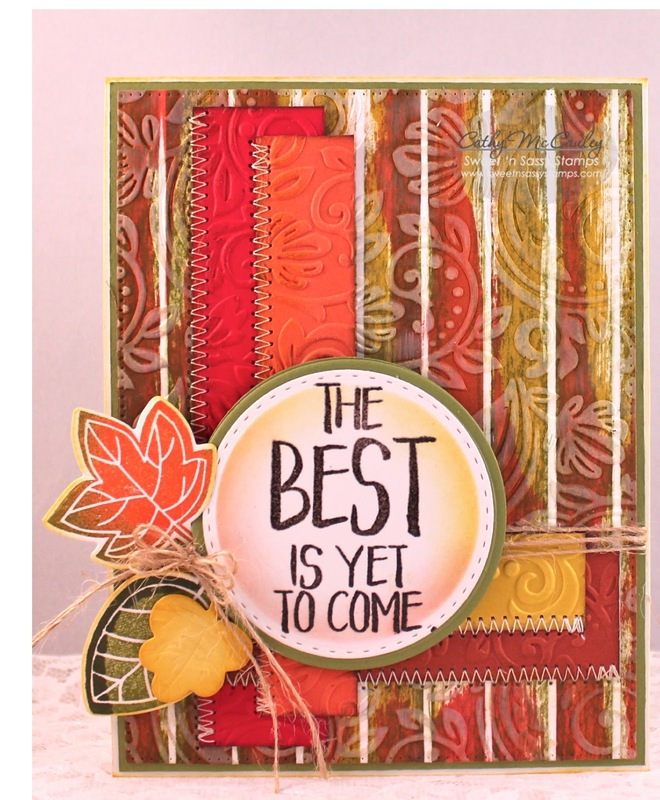 Real Red, Tangerine Tango, Old Olive, Cajun Craze, Hello Honey, and Craft White inks and a KaiserCraft embossing folder were used. 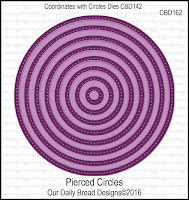 The sentiment was embossed and cut with a pierced circle die. 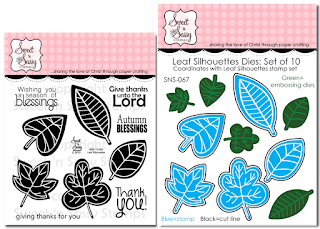 A few Leaf Silhouettes were stamped, cut with the matching Leaf Silhouettes Dies, and added to the card along with some jute twine. This card could be used for many different occasions, but I'm planning on using it for a good friend's birthday. Praying for those in Florida and along the East Coast…stay safe! Christmas Peace, Love & Joy! Hello friends! My thoughts and prayers are for those along the coast and in Florida this morning. Stay safe! 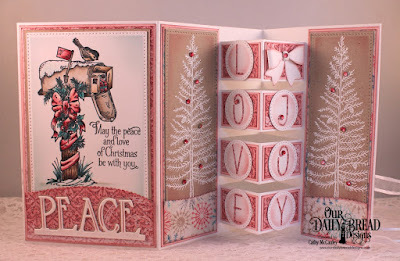 Creative Nugget: After creating the base of the card, each panel was lined with pink card stock and beautiful papers from the Christmas 2014 Collection by Our Daily Bread Designs. The mailbox image from the Christmas Note stamp set was colored with Copic Markers, the sentiment from Joys of the Season was embossed, the Peace Border die cut added, and the card closed with some organdy ribbon. 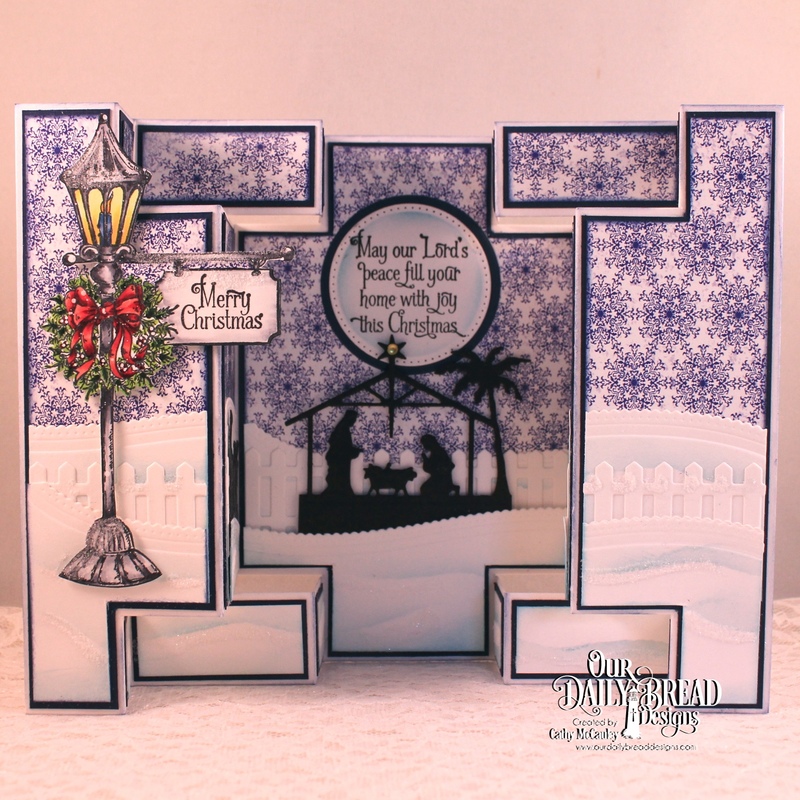 The tree from the Joys of the Season stamp set was white embossed on two Neenah Kraft panels and the snow drifts were cut with a Leafy Edged Border Die. 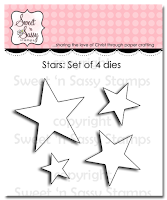 Other dies used include the Pierced Rectangles Dies, Pierced Circles Dies, the Alphabet Dies, and the Mini Bow Die. A few gems colored with a Copic Marker and Wink of Stella were added for some sparkle and to finish the card. Thanks so much for stopping by…hope you've been inspired to try a fancy fold! Hello friends! 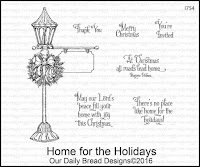 It's beginning to look a lot like Christmas at Our Daily Bread Designs. 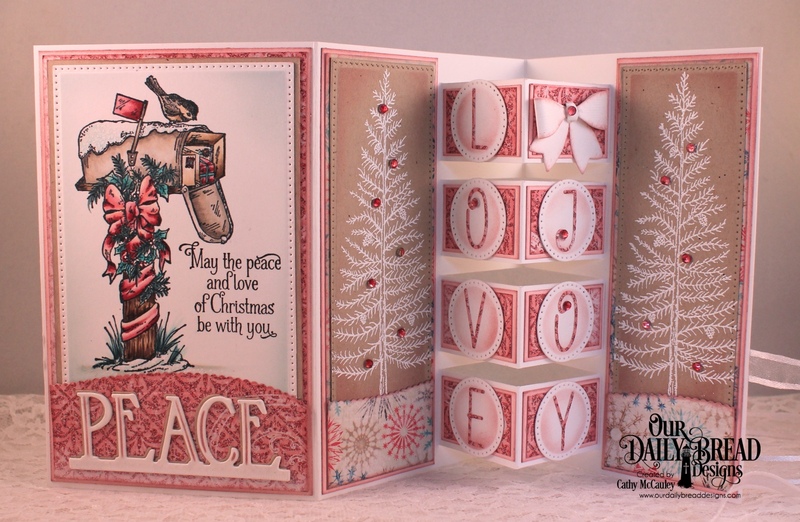 The October 2016 release includes four new Christmas stamp sets, four fabulous die sets, three of which are Christmas word borders, and a gorgeous Christmas Card Paper Collection. 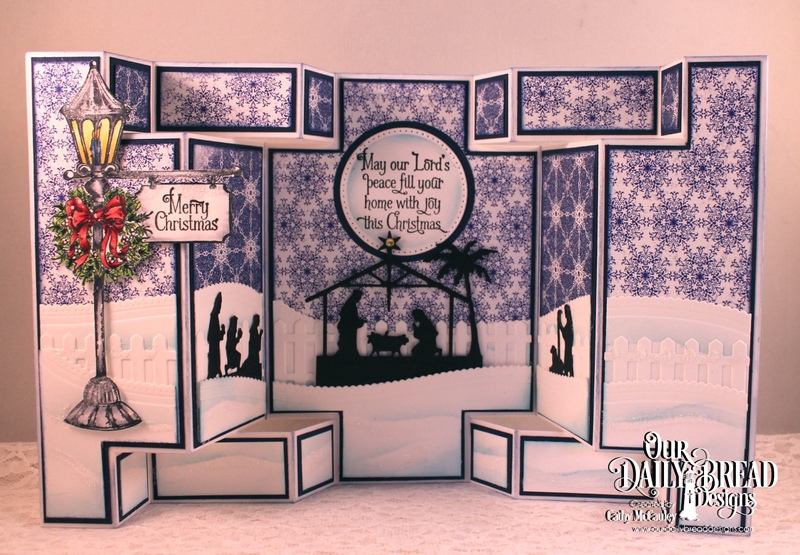 The stunning samples made by the ODBD Designers will inspire you to get started on those Christmas cards if you have not already done so. Three randomly selected winners will each receive a $25 gift certificate to the ODBD Store to be used toward the purchase of ODBD Stamps found in the "stamps column" of the website just for commenting on the Design Team cards! You have until October 2, 2016 at 9:00 p.m. EDT to leave your comments on the Designers' Blogs for a chance to win! The Winners will be posted on the ODBD Blog on October 3rd, so be sure to check back there to see if you won! 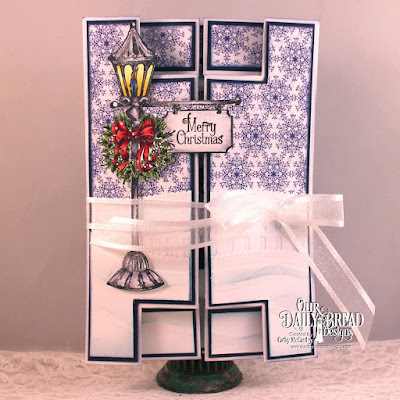 My first sample was made using the new Christmas Note stamp set and the beautiful new Christmas Card Collection 2016. 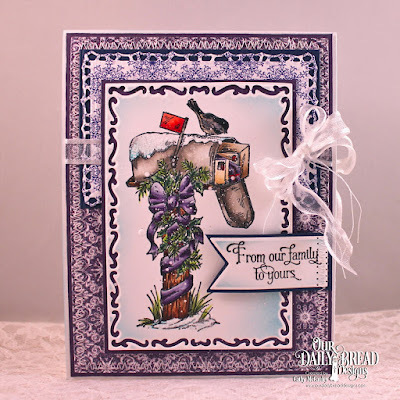 Creative Nugget: The beautiful papers from the Christmas Card Collection 2016 and the image panel were cut with Lavish Layers Dies and the purple layer stitched to the card front. The mailbox from the Christmas Note stamp set was colored with Copic Markers and splattered with white acrylic paint. The sentiment banner was hand cut and an organdy ribbon added to finish the card. 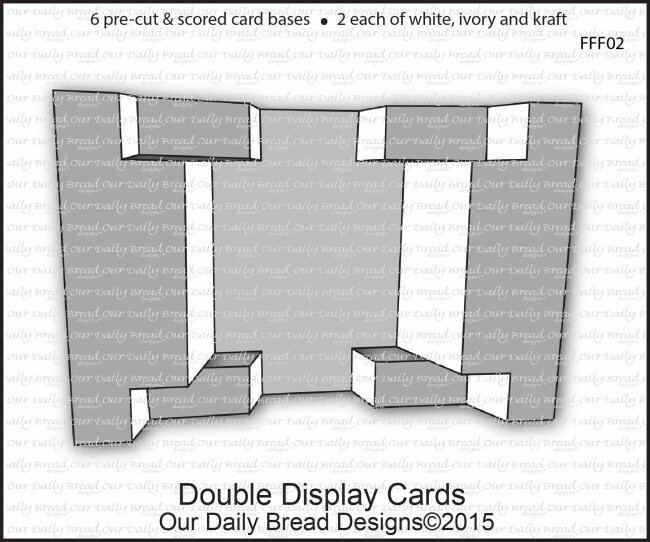 Creative Nugget: The panels of the Double Display Card were lined with papers from the Christmas Card Collection 2016. 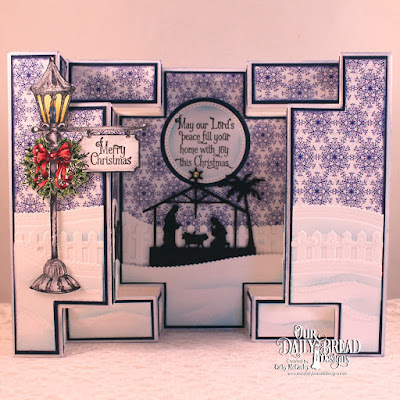 Snowy layers were cut with a Leafy Edged Border Die and sponged with distress ink. 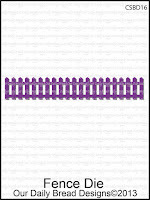 The Fence Die was used to cut a fence border between the snowy hills. The light pole from the Home For the Holidays stamp set was colored with Copic Markers, fussy cut, and popped onto the card. 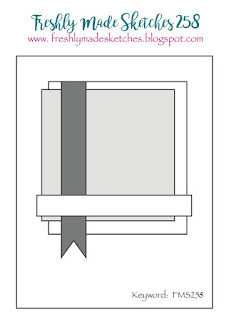 An organdy bow holds the card closed. 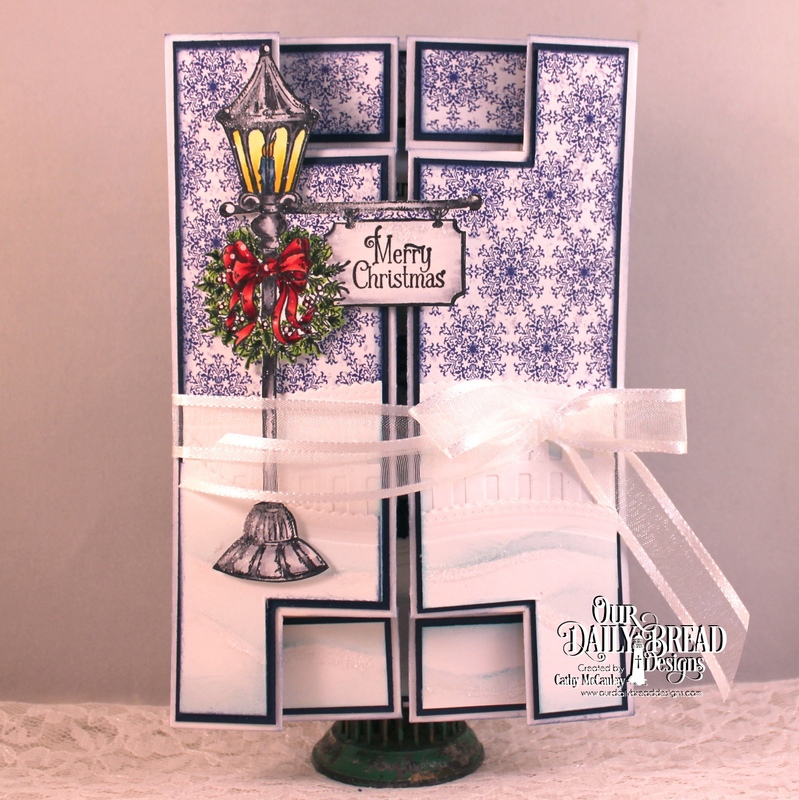 When opened, another sentiment from the Home For the Holidays set was cut with Circles and Pierced Circles Dies and added above the Holy Night die cut. 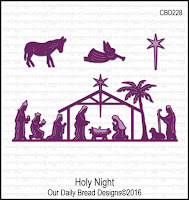 The Holy Night die cut was cut apart so the shepherds and wisemen could be added to the side panels. Thanks so much for stopping by…hope you are inspired by the hop and have a wonderful weekend!